In the world of insects, the ladybug is a more welcome sight than most. These tiny beetles are normally no more than a quarter-inch in length, and the term "ladybug," is not gender specific. They're normally seen in the garden in warmer months and hibernate in the winter, but with a little tender loving care, ladybugs can hunker down inside with you. A small enclosure, approximately 4 by 7 inches with suitable ventilation holes, is perfect for a ladybug. Bug terrariums can be purchased, but it's simple to create your own from a jar or small box. Line the bottom with paper and scatter foliage throughout. Small pieces of cardboard or twigs will give your ladybug something to climb on. A damp, not dripping, paper towel or clean sponge will provide a water source for your pet ladybug, and aphids or wet raisins are suitable food. You can't overfeed a ladybug, as she'll eat what she needs, just as she would in the wild. Keeping your ladybug's domicile clean is as simple as wiping it down with the paper towel when you swap it out for a fresh one. 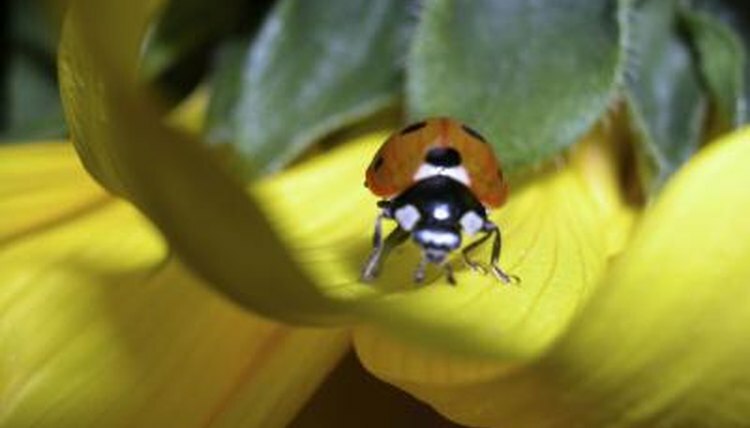 Ladybugs normally won't lay eggs in captivity and overrun their enclosure, as they need pollen sources to do so. Their life expectancy is only about a year, so when spring comes, you might want to release your ladybugs into the wild. Does Trumpet Vine Poison Cats?